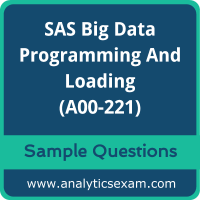 Here are the sample questions which will help you be familiar with SAS Big Data Programming and Loading (A00-221) exam style and structure. We encourage you to try our Demo SAS Big Data Professional Certification Practice Exam to measure your understanding of exam structure in an environment which simulates the SAS Certified Big Data Professional Using SAS 9 Certification test environment. To make your preparation more easy for SAS Certified Big Data Professional Using SAS 9 (A00-221) exam, we strongly recommend you to use our Premium SAS Big Data Professional Certification Practice Exam. According to our survey with certified candidates, you can easily score 85% in your actual SAS Certification exam if you can score 100% in our premium SAS Big Data Professional Certification practice exams. Q1: In the example below, the input data set is a Hive table accessed using a SAS/ACCESS to Hadoop LIBNAME statement. Which statement is true about this program? A. BY statements do not require the data be received by the procedure in any specific order. B. The procedure will fail unless the table HIVELIB.MYHIVETABLE is already stored ordered by YEAR. C. BY statements are not supported for Hive tables because it is not possible to order data that is distributed on different nodes of the Hadoop cluster. D. SAS will generate a HiveQL query to return the data to SAS ordered by YEAR so that the procedure receives the data ordered by YEAR as required. Q2: Many temporary tables may be created in the LASR server by PROC IMSTAT analysis actions. What happens to temporary tables when a PROC IMSTAT session is terminated? A. All temporary tables are saved to the SAS server WORK library. B. The last temporary table created is saved to the SAS WORK library. C. All temporary tables are purged from the LASR server. D. The last temporary table created is saved to storage in the HDFS. ERROR: Parse encountered type when expecting identifier. NOTE: PROC DS2 has set option NOEXEC and will continue to prepare statements. Which of the following changes will fix the errors shown in the log? What happens when the program is executed? -- The variable order_timestamp is created and processed as an ANSI timestamp value in the DS2 program. -- The order_timestamp value is converted to a SAS datetime when it is written to the output SAS data set. -- The output data set stores the values as a SAS timestamp value. -- The program does not execute because order_datetime is a SAS datetime value. -- The variable order_timestamp is converted to a SAS time value. -- The output data set stores this as the number of seconds since midnight. Q5: This question will ask you to provide a line of missing code. Which line of code would you insert to get the mean and standard deviation of INCOME and AGE, calculated separately for GENDER variable values F (female) and M (male)? Q6: Web server logs are written in an HDFS directory. The following lines indicate the format and an example of the comma-separated values for one line in the log file. Which CREATE TABLE statement enables a Hive query to access each of the fields? Q7: What is an advantage of using a LIBNAME statement to interact with your Hadoop cluster? A. It enables some SAS procedures to push processing into Hive. B. It ensures that Hive will handle all processing. C. It enables you to submit user-written HiveQL code to Hive. D. The GENERATE_PIG_CODE= option enables you to bypass Hive and generate Pig Latin code. Q8: When working with data stored in Hadoop, which SAS function is NOT passed to Hive by default? Q9: Which operator is NOT a diagnostic operator for testing a Pig program? Q10: Which statement creates a temporary array within DS2? Note: Please write us on feedback@analyticsexam.com if you find any data entry error in these SAS Certified Big Data Professional Using SAS 9 (A00-221) sample questions.